Protect everything from your gel coat to your vinyl seats. Our marine packages come with an 18 month + life span on exterior gel coat. Unlike wax the only way to remove this coating is through abrasion. Make scrubbing hard water spots a thing of the past. We can coat anything automotive related from your wheels and calipers to the leather inside and everything in between. We offer one step polishes to full paint corrections. Ceramic coating not only makes your paint glossier but allows for much easier cleaning. A ceramic coating forms a permanent bond with the surface and will not wash off or break down. Ceramic coatings can only be removed by abrasion. It is a highly durable coating that protects your vehicle's paintwork or any other surface from damaging contaminants. This coating is the last step applied during your car detailing process. Ceramic coatings or sometimes referred to as nano-coatings are a type of liquid polymer that is non-metallic and bonds to your vehicles clear coat at the molecular level. A nano-coating offers a protective layer to the factory paint of your car or truck. It can also be applied to watercraft gelcoats, creating a layer of protection for your boat. Can Ceramic Coating Be Removed? Ceramic coating is very, very strong. Because of this it can only be removed through the process of abrasion. Only careful polishing can fully strip away the layer of nano coating. Although there are some alkaline chemicals that have been known to do some damage to these type of coatings, they still aren’t very effective. At the end of the day the process of abrasion is the best method for completely removing a layer of ceramic coating. Because nano coatings bond at the molecular level with your car’s clear coat or boat’s gel coat you can imagine that ceramic coating becomes essentially one with that layer. It creates a very strong layer of protection that offers a good amount of resistance to certain environmental factors. UV Protection: Ceramic coatings can protect your vehicle from harmful UV rays that lead to oxidation (discoloration). Think of it as a layer of sunscreen for your skin, only in this case it’s the gel coat of your car. And a layer of ceramic coat is excellent at preventing rust and keeping your vehicle’s value intact for years to come. 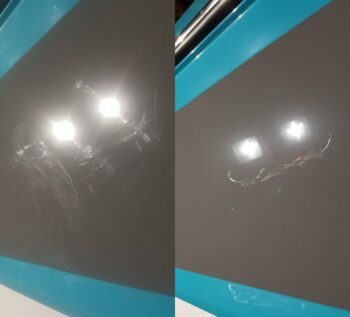 Most Scratches: Ceramic coatings aren’t completely scratch-proof, but they do offer quite a bit of resistance to minor scratching and blemishing. It won’t guard your vehicle against chipping caused by rocks, but it will protect the coat from grit and road grime that can scratch the surface. It’s also helpful against things like the brushes that you encounter at the car wash.
Hydrophobic & Hylophilic: Nano coatings handle water very well. They prevent water spots from forming as well as etching into your car or boats surface. Hydrophobic means that the ceramic coat beads water; while hydrophilic means that the coating sheds water. When working in unison it creates a great level of protection against H2O. Easier To Maintain: Ceramic coating is also very helpful when it comes to things like bug debris, mud and bird droppings. These things have a harder time adhering to nano coats; which means that wiping down and cleaning up the surface is a lot easier than if you were to just use an everyday auto wax. Long Lasting: Different products claim different warranties. We use a product that lasts for 2 years and another that carries with it a 5 year protection warranty. Because of this it’s actually more cost effective in the long run. Auto or boat maintenance is an ongoing process, but the amount of maintenance and upkeep is reduced; meaning that you can save more money over time. Snow & Ice Resistant: ceramic coating does a great job at making it difficult for things like dirt, mud, snow and ice from sticking to your car’s surface. This keeps it cleaner and protects the paint coat. Can I Apply Ceramic Coating Myself? If you’ve got a touch of the DIYer bug then yes, you certainly can apply nano coating yourself, but you may want to refrain from doing so and allow a professional to work on vehicle or boat instead. For one, although there are products that are sold at the consumer level, the products that a professional has access to are bar none. Another reason to go with a professional is the fact that they also have access to superior equipment in most cases. But the final and probably best reason to not ceramic coat your car yourself is the fact that when you go with a pro, you’re paying for all of their knowledge and experience. One of the biggest issues with coating a vehicle or boat yourself is not knowing how to polish and prep the surface properly, first. If you don’t understand paint correction and then you go to put a layer of ceramic coating on, you might end up locking in all those nasty imperfections. What Can Ceramic Coating Be Applied To? When we ceramic coat a client’s vehicle or boat we can offer a special product for window protection, vinyl protection and the actual clear coat or gel coat of the item. We can also coat things like cup holders, consoles, headlights and certain seating surfaces.